On 25 February, PRI’s Executive Director, Alison Hannah, took part in a UN High Level General Assembly Thematic Debate on Integrating Crime Prevention and Criminal Justice in the Post-2015 Development Agenda. The aim of the discussion was to tackle the challenges for sustainable development posed by transnational crime organised crime, illicit trafficking and corruption. Most speakers focused on the importance of the Rule of Law and crime prevention to ensuring sustainable development. Many referred to how combating crime, providing access to justice for all, and building effective, accountable and inclusive institutions at all levels would be critical to achieving the “peaceful and inclusive societies” essential for sustainable development described in the proposed new Post-2015 Goal 16. In 2011, the UN Special Rapporteur on Extreme Poverty and Human Rights commented that ‘disproportionately high numbers of the poorest and most excluded (people) are arrested, detained and imprisoned’. This is not necessarily because they commit serious offences. Many strategies for overcoming poverty are criminalised – for example people may be charged with begging, being a vagrant, street trading, or committing some other petty offence. But once arrested, they are most likely to be held in detention. If there is no effective legal aid system they have no-one to advise or represent them; poor people cannot afford lawyers, pay money bail or bribes to get out of jail. Inefficient legal procedures mean that once arrested, they can be held in detention for months – sometimes years – waiting for trial. This impacts on their physical and mental health. It also has a damaging effect on their families, who lose their main breadwinner or carer as they languish in detention. Families become homeless or break down as they are unable to manage on their own. In many states, penitentiary systems are overstretched and under-resourced, with few treatment or rehabilitation programmes available to support offenders. In these circumstances, people who go to prison are likely to re-offend on release, as they return to the same circumstances that led to their arrest in the first place. This exacerbates the cycle of poverty and marginalisation. People often say that prison is a school for crime. This damaging impact can be reduced by reintegration programmes that provide treatment and support for prisoners during and after their sentence: for example treatment for drug or alcohol dependency, vocational and life skill trainings, probation supervision and mentoring. But community-based sanctions and programmes are often more effective in reducing recidivism and much cheaper. While serving a sentence of probation or community service, the offender can earn a living and keep the family together. Investing in alternatives to detention is particularly important in relation to children and women. Women are a minority in the criminal justice system (usually 5–9 per cent of prisoners). Because of this, their needs are often overlooked. Many have experienced violence and sexual abuse and as a result, suffer high levels of mental illness and substance dependence. They are more likely to self-harm or commit suicide in prison. The UN Rules for the Treatment of Women Prisoners (the Bangkok Rules) recognise and address their particular needs – and also strongly encourage the use of gender-specific non-custodial measures. Implementation of these Rules would enable women to improve their lives in the community. Children also have special needs arising from their vulnerability in the criminal justice system. Research shows that children who go through the formal court process are more likely to re-offend in the future. They are also more likely to suffer violence and abuse in detention and the effects on them may be life-long. This is why detention should only be used as a measure of last resort and for the shortest time. The High Level Panel commented in their recommendations for the next development goals that no-one should be left behind – this should apply most of all to children. Photo: Allan Gigichi, Kenya 2014. 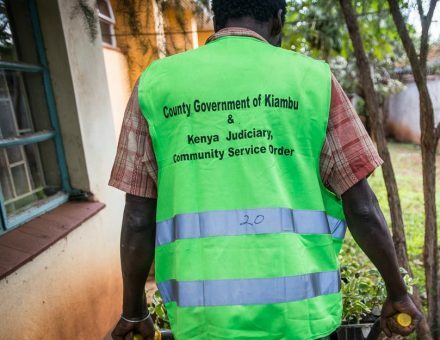 Community service programmes like this tree seedling project run by the Kenyan Probation Service enable offenders to continue to work and earn money to keep their families whilst doing useful work for the community.